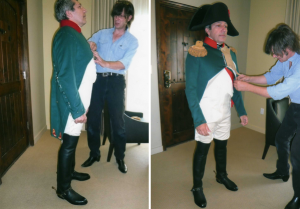 Last June I was hired by the costume designer, Marlene Stewart to consult with her and to make Napoleon’s uniforms as well as the hussar bodyguards for the film Night at the Museum 2. She found me after inquiring around the Hollywood costume community for a Napoleonic expert and all fingers pointed towards me (which was very flattering to me as I haven’t been active in that business for 9 years). They actually hired me in March of ’08 but due to casting difficulties, there wasn’t an actor for Napoleon until two weeks before shooting started so for the first two weeks of June last year I was working night and day at the eleventh hour. The actor that was eventually chosen was Alain Chabat, the French comedian and we (myself, the boot maker and the costume supervisor) met up with him for the first time at his rented villa in West Hollywood to take initial measurements. I only had one week to make the pattern and the initial costume, left unfinished for the first fitting. Costumes are always left unfinished for the first fitting so we can see how the construction is working so far, then when I’m convinced I’m on the right track, the costume is finished completely. If I had the luxury, I would have called for a second fitting to make sure the finished costume was perfect before he wore it on camera. As it turned out, because of time constraints, I only had that one fitting so I had to use all my powers and knowledge to make sure it was done right the first time. Nerve-wracking work. The first two photos out of five are the first and only fitting I had with Alain at his villa and show me fitting the unfinished costume on him. The boots were made by another artisan who also was working under the gun. The hat was made by a third artist. The last three photos show the finished costume on a suit form at the workshop of C&J Tailoring in North Hollywood (the famous Mr. O). I handed them my original and copies of my patterns and they cranked out the multiples necessary for film work. That is, more than one of the same costume is always needed in case of accident, such as spilled coffee at the craft service table. I made the original, Mr. O made the stunt copies. The gold bullion epaulets were bought from Peter Twist of The Discriminating General in Canada.